Arriving in Sao Paulo for IPC-8, I checked the online schedule for the Permaculture Convergence and saw that the organizers had set me down for a morning session on "making money from tree planting" (I have since turned that into an article for this issue of The Activist). Caught by surprise, I had to scramble to prepare a powerpoint and one of the ideas I thought to explore was biofuels. Conventional wisdom has it that "agrifuels" are in competition with food production and climate remediation. I dashed off an email to David Blume asking for an example of "permafuel." He replied, "Well to take a page from the book. In semiarid areas where the temperature goes no lower than 0 degrees F you can plant an overstory of mesquite to provide both 340 gallons of alcohol per acre from the pods and fuel the plant with coppiced branches from the tree. In the understory you plant perennial Opuntia (nopales) thornless cactus, and between there and the dripline and beyond you plant the starchy root crop, Buffalo Gourd, for a total yield of far over 1000 gallons per acre without irrigation." There you have it, a polyculture for food and fuel. But what about climate change? I wrote him back, "Would you say the guild above is a net carbon sink?" He responded, "It is absolutely a massive carbon sink. Pretty much all arid country crops put the majority of their growth underground and have a robust mycorhyzzal feeding regime. Perhaps 80+% of carbon produced in the top growth is exuded for rhizosphere associates. Mesquite is unique in that a large portion of its root burrows deep to support it with water extracted from far below. There have been recorded instances of mesquite going down 160 feet for water." And that, in a nutshell, is Farmer Dave's permafuel thesis. That he takes several hundred pages to flesh it out, in Alcohol Can Be a Gas! Fueling an Ethanol Revolution for the 21st Century, is an enduring blessing for permaculturists everywhere. This six-volume set, bound into one thick paperback, is both required reading and a standard reference on a par with A Pattern Language and David Jacke's Edible Forest Gardens. The six books contained in one are, in order, Understanding Alcohol: Visions and Solutions (including "busting the myths," polyculture and photosaturation, and Brazil's national program dissected), Making Alcohol: How to Do It (including 30 odd feedstocks from algae to whey, the sugar method, the starch method, fungal and bacterial enzymes, fuels, and distiller construction), Co-Products from Making Alcohol (animals, aquaculture, mariculture, mushrooms, methane, etc. ), Using Alcohol as Fuel (carburetion, injection, small engines, flex-fuel conversions and cogeneration of heating, lighting and cooling, and typical conversions), The Business of Alcohol: Hands-On Advice (legal and economic considerations and case studies); and A Vision for the Nation (state and federal incentives, Community Supported Energy and permaculture). Just exactly what is the appropriate role for alcohol fuels is an old, but ongoing discussion, and it has been known to get heated at times. The Tortilla Rebellion in Mexico, catastrophic overplanting of maize and soya, gene splicing by multinationals for cellulosic substrate alchemy, forest clearing worldwide --these are serious concerns. As I write this, the U.S. Senate is considering legislation to increase ethanol production by giving generous subsidies to the U.S. farm belt. The pending bill mandates the use of 15 billion gallons of biofuels annually by 2015 and 36 billion gallons by 2022 (up from 8.5 billion subsidized gallons now). Nearly all of this would be corn ethanol, taken from grain stocks, with the stover burned or plowed in. Beginning in 2016, the government would ask farmers to add the corn stover, along with switch grass or wood chips, to make annual increases of 3 billion gallons in "cellulosic" ethanol. This legislation faces opposition from Big Oil and food manufacturers, but is just the kind of massively soil-destroying, economically bankrupting, petro-addicted type of legislation that is likely to be viewed by politicians as harvesting votes in the Iowa caucuses. By showing how ethanol can be ethically produced in combination with food, soil, carbon sequestration and other objectives for healthy system design, Blume provides a rescue remedy for our planet at a time when it could scarcely be needed more. Loek Boonkamp, who studies agricultural trade and markets for the Organization for Economic Cooperation and Development, estimates replacing just 10 percent of the world's current petroleum use with biofuels would consume about 30 percent of all the grain, oilseed and sugar produced in the U.S., Canada, the European Union and Brazil, not to mention a huge volume of water. Blume takes Boonkamp's argument head-on. The US has 1500 million acres of agricultural land and uses 70 million -- about 5 percent -- for corn. Mesquite covers 70 million acres of desert land. Harvesting mesquite pods would yield more alcohol than corn without any inputs of soil, fertilizer or water. The US could achieve similar yields from the lawn clippings coming off suburbia on any given Saturday (30 million acres at last count). There are dozens of these examples in the book. Moreover, one has to consider how much of that corn produced in the US is actually used as a food, and how much is used in floor wax, plywood, crayons and other products. But then, why use farmland at all? Why not harvest ethanol from cattails or dried seaweed? Willows and bamboo planted on berms separating long canals of cattails, with greywater, spent mash and fermentation carbon dioxide returned to the roots could yield 10,000 gallons of ethanol per acre. The Chinese are getting 4.8 dry tons per acre off seaweed from coastal waters, and the Vietnamese, who farm shrimp from April to September, harvest algae from the same shallow lagoons and estuaries the rest of the year. Kelp grown on nets can cover hundreds of acres of ocean and provide bread flours, carrageenan, agar and other ethanol co-products while also restoring health to over-nitrified "dead zones." Blume estimates the energy return on marine ethanol is on the order of 15 to 1, significantly better than current returns on petroleum exploration and production. In Albert Bartlett's classic lecture on exponential growth, he uses the example of a bottle filled with bacteria. Bacteria grow by doubling, so one bacterium divides to become two, the two divide to become four, and so on. Suppose we had bacteria that doubled this way every minute. Suppose we put one of these bacteria into an empty bottle at eleven in the morning and then observed that the bottle was full at 12 noon. First Question: When was the bottle half full? Answer: 11:59, one minute before 12, because they double in number every minute. Second Question: If you were an average bacterium in that bottle, when did you first realize that you were running of space? Answer: At 12 noon the bottle is full. One minute before that it's half full. Two minutes before noon it's a quarter full, then an eighth, then a sixteenth. At five minutes before noon, when the bottle is only 3 percent full and 97 percent open space just yearning for development, it is unlikely you, being a bacterium, would realize there's a problem. If bacteria had human intelligence, you might see your predicament in the last ten seconds. Last Question: How long can the growth continue as a result of this magnificent discovery? Answer: Suppose the bacteria are very smart -- even smarter than humans -- and they go out in that last ten seconds and find three more bottles and get back with them before noon. At 12 noon, one bottle is full and there are three to go. At 12:01, two bottles are filled and there are two to go, and at 12:02 all four are filled and that's it. Game over. They'd need to find four more bottles to go another minute. The WorldWatch State of the World 2007 report includes a graph showing that Earth's carrying capacity was crossed in 1989-1990. 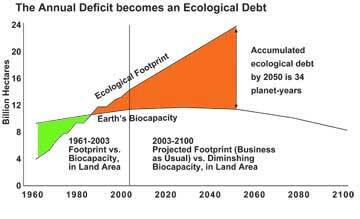 Mathis Wagernagle calculates that we have been in deficit spending ever since, adding stress and diminishing resilience with every passing year, so that by 2050, at present rates, we will be 34 planet years in debt (see graph). Source: François E. Cellier, Swiss Federal Institute of Technology, Zurich, internal seminar, April 2007, after Mathis Wagernagle, "One Planet Economy: An Empirical Baseline for SD," Alliance for Global Sustainability Annual Meeting, March 19, 2007. Says Bartlett, "[I]t is an inconvenient truth that all proposals or efforts to slow global warming or to move toward sustainability are serious intellectual frauds if they do not advocate reducing populations to sustainable levels at the local, national and global scales." That is where David Blume's permafuel formulation comes in. I recently got into an argument with the author about population sustainability. We went around about "what good is it to put people in ethanol-powered cars if by doing so they can postpone addressing the fundamental problem of consumer society." After assuring me that he understood the point made by Bartlett, and the relationship between development, womens' rights, infant mortality, senior care and fertility, he reminded me that his prescription of small-scale, polyculture ethanol production bore little resemblance to the industrial, mechanical, globalizing production meme. Localized societies, whether island cultures, forest cultures, mountain cultures, or whatever, do not tend to overpopulate. They stabilize at equilibrium with their resource base. Local fuel production is inherently population-stabilizing, if for no other reason, because water supply is a limiting factor. Two decades ago, when I was writing Climate in Crisis, I first heard the reference to the growth of greenhouse gases as a "hockey stick" but it wasn't until more recently that I realized I was looking at the hockey stick from the wrong end. I saw the millennial timescale on the x axis as the handle, the sudden jump of GHG and concommitant temperature change as the blade, which had thrust us suddenly half a degree warmer in the 20th Century. Now I see that I was holding the stick by the blade. The y axis is the handle. According to the IPCC report just released, world temperatures may rise 6 degrees by 2100, or perhaps 2050. It really doesn't matter even if the process takes several centuries, because a change of that magnitude would spell the end of terrestrial life as we know it. The Anthropocene will draw to a close and every form of life on Earth will adapt or perish. Globally averaged temperature change for Northern Hemisphere from 1000 to 2050 (projected) based on measurements compiled from the Hadley Centre in the UK, the UN Grid Arendal project in Norway and consensus projections by IPCC and others, adapted by author.